After the ‘buzz’ and drama of “The Spine” it was time to head back to business as usual. This walk could have been a big mistake. A look at the map for Rishworth Moor shows several ‘drains’ that feed the reservoirs on this high section of Pennine moorland. Drains? Reservoirs? That all sounds like a bit of a watery theme then! Well, not on this walk it wasn’t. 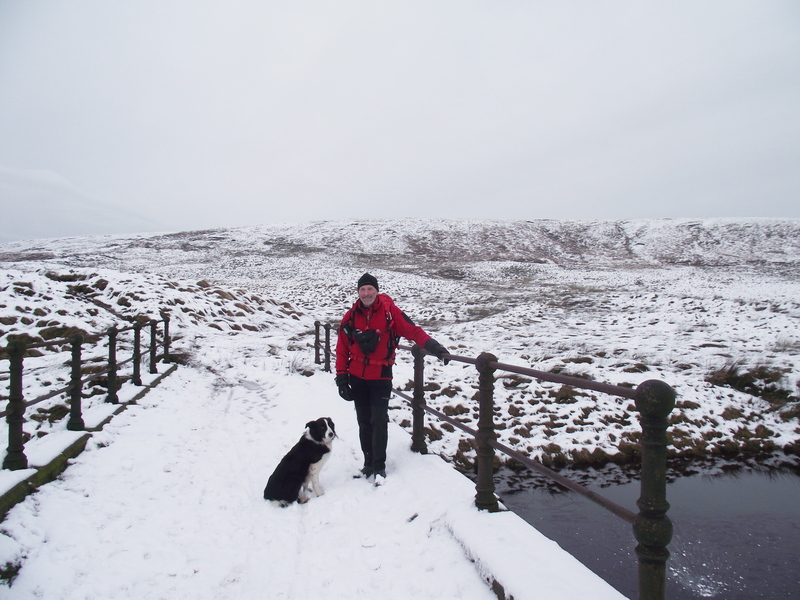 We had left Shipley on a normal, grey January day, but as we gained height on the drive over, we realised that there was a snow line, and though our objective for the day was modest enough, it was sure to be up in the white stuff. 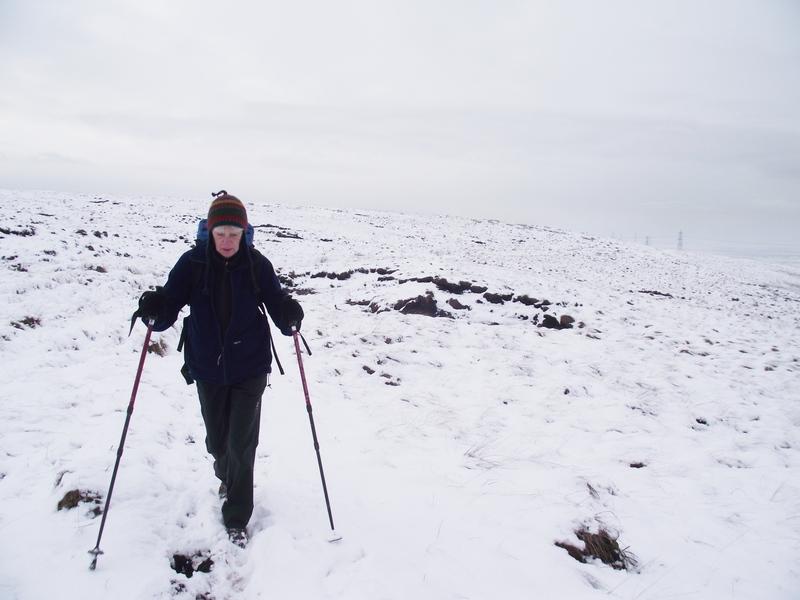 Pennine walking is a bit of an acquired taste, usually involving boggy and peaty uplands separated by deep valleys. Today’s route didn’t really have any severe ups and downs, and the cold meant better going on frozen mud rather than liquid mud. 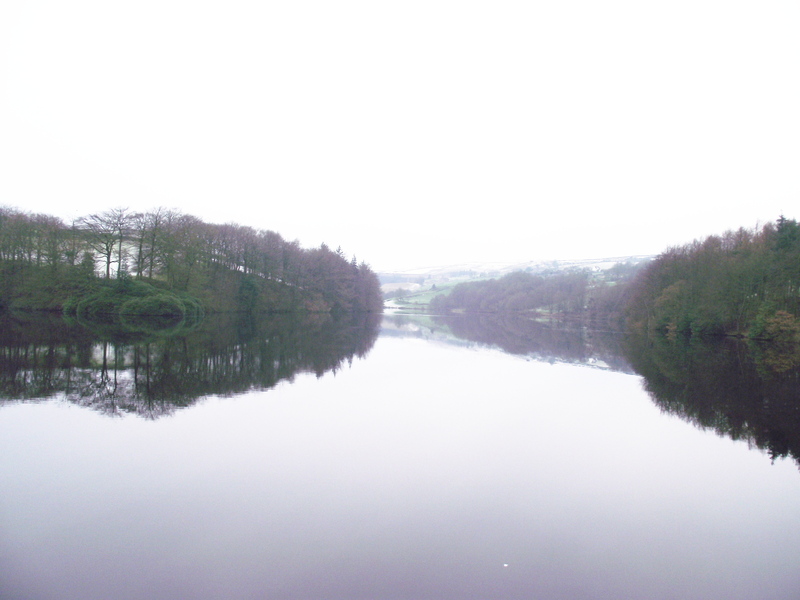 We set off from Ryburn Reservoir with good conditions underfoot but terrible light for pics. 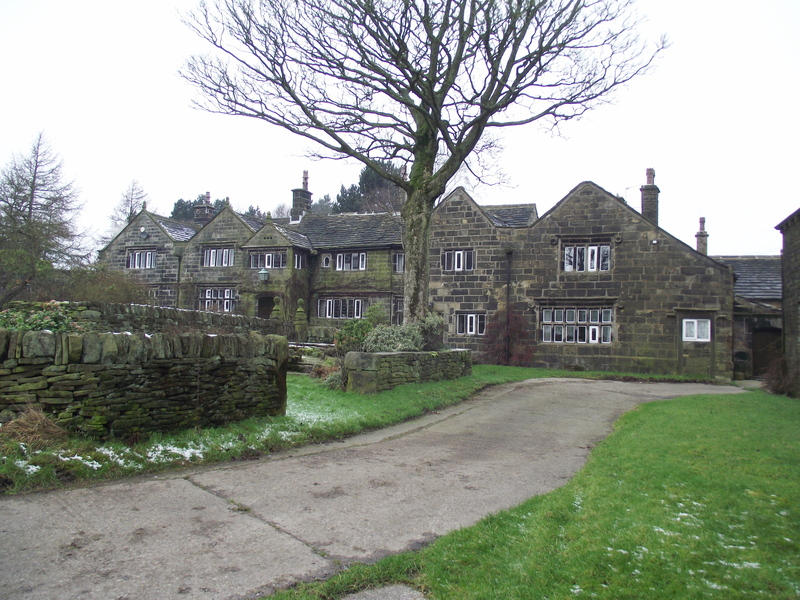 Passing the impressive house of Upper Cockcroft Farm we took the track to Pike End to hit Blackwood Edge Road. Where I come from, a road is usually wide enough for a car and has a hard surface. 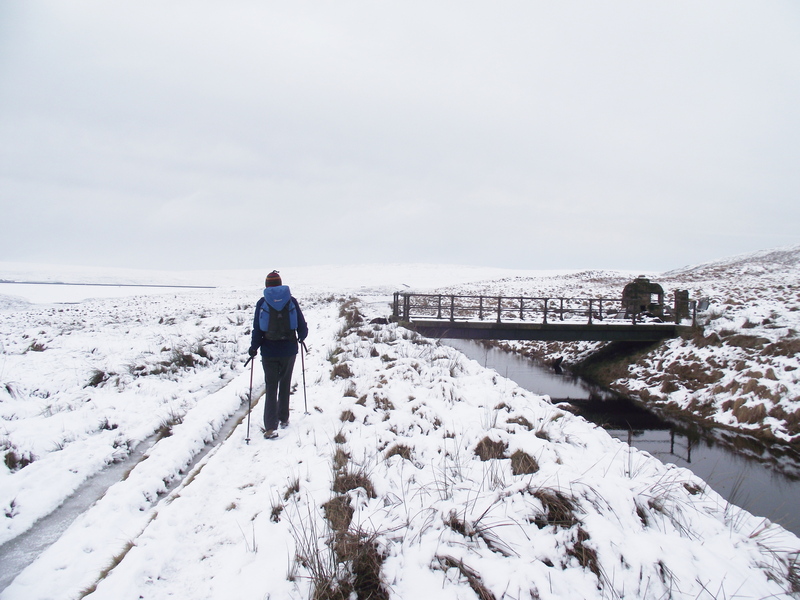 Blackwood Edge Road was mostly the width of a horse, and under warmer conditions would have been a mire rather than a path, but the freeze allowed good progress. However, if it wasn’t really a road, why could I hear heavy traffic? The answer became obvious as the M62 motorway came into view 1½ kilometres away. Our gradual height gain levelled out at about 412 metres, our highest point of the day – no problems with the altitude today, then! 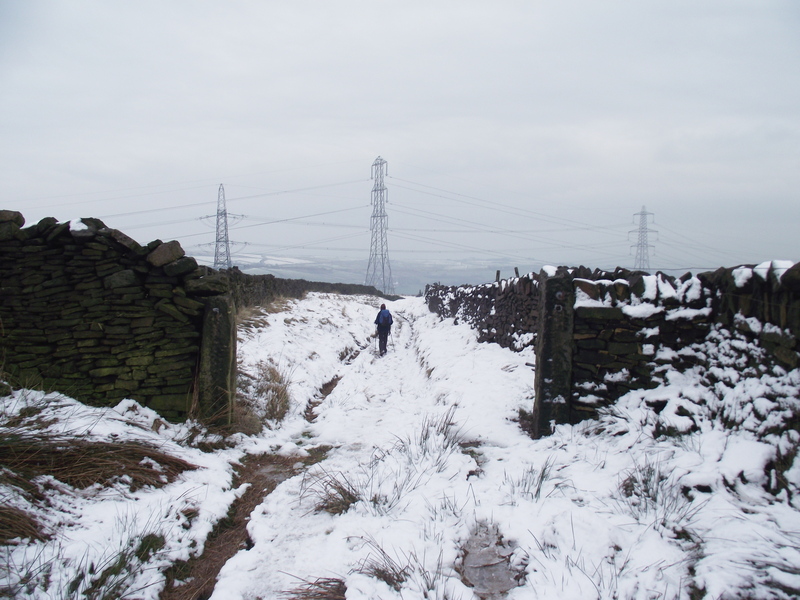 The frozen path led us down to one of the drains feeding Green Withens Reservoir, with a view across the reservoir towards Blackstone Edge where we had walked in warmer weather in mid October (blog post #49). A coffee stop was kept short to avoid getting too chilled, then it was off again. Not the most exciting day out, but an interesting one. 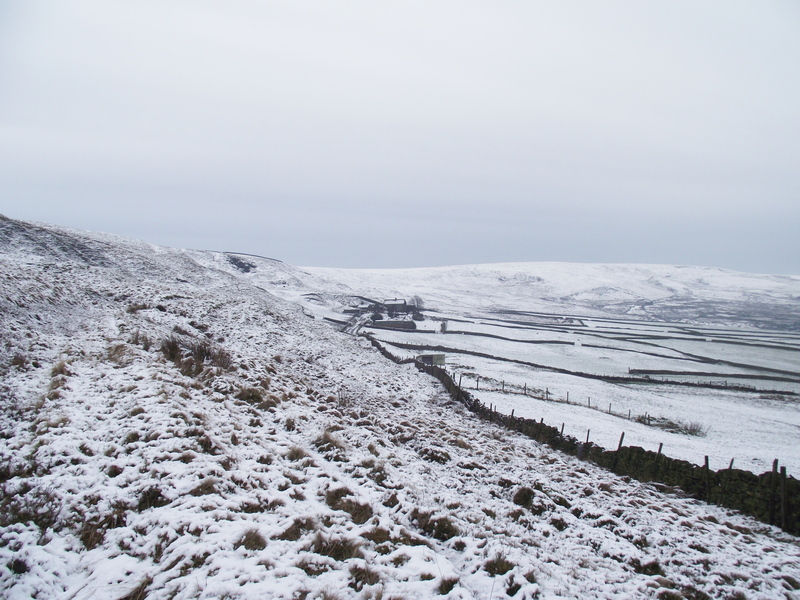 I’ve looked at these hills many times from the M62 Motorway, and I’m gradually building up a picture of what’s up there in all that high moorland – a load of snow, apparently! This entry was posted in 4. 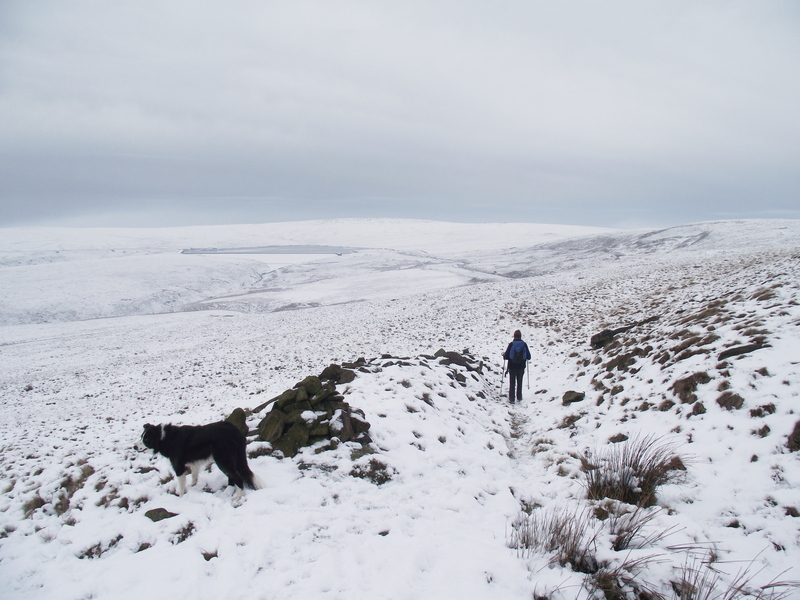 Northern England and tagged hillwalking, winter, Yorkshire. Bookmark the permalink. 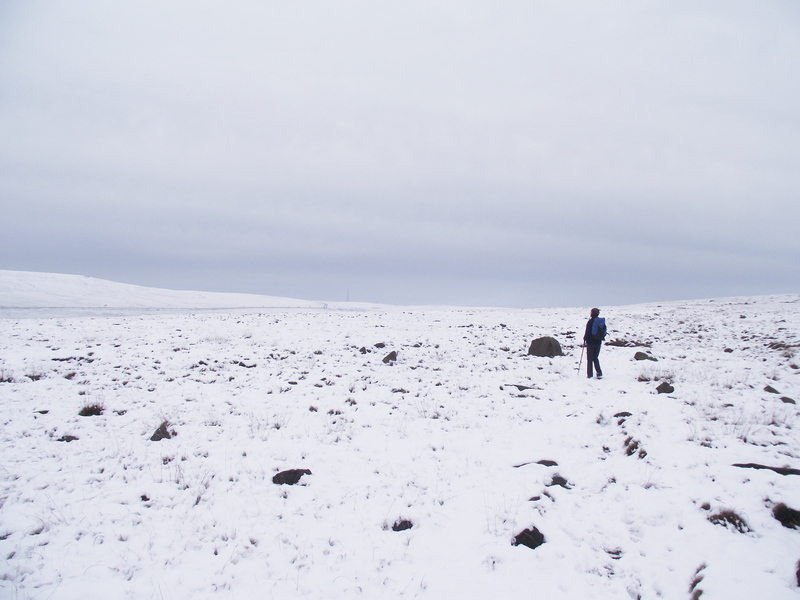 great paul, that’s the very ‘bleak british moor’ i was thinking about in my text – where violet gets lost. 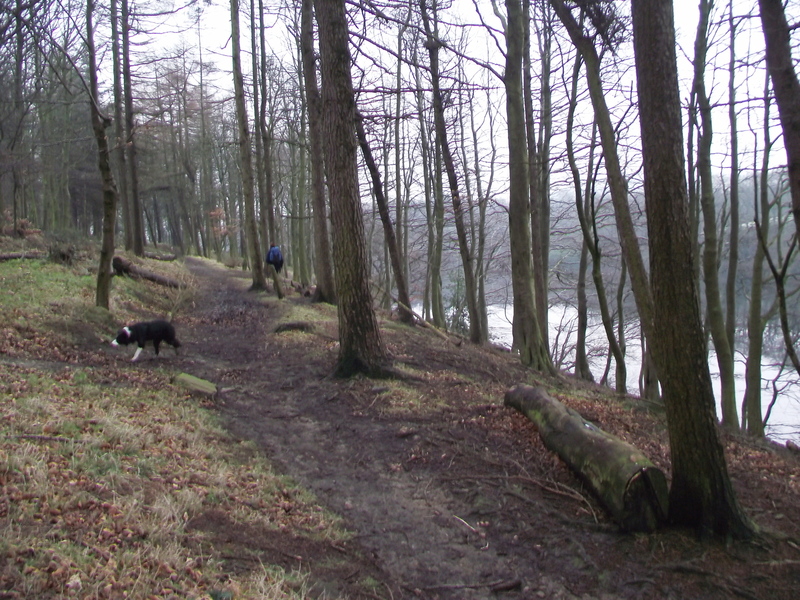 loved the photo ‘near dog hill’ (- with dog). by the way, next time you’re passing upper cockcroft farm, do drop in… we’d love to see you! Hahaha…. I wondered who the rich capitalist git was who owned that. Could we rent the East Wing from you? 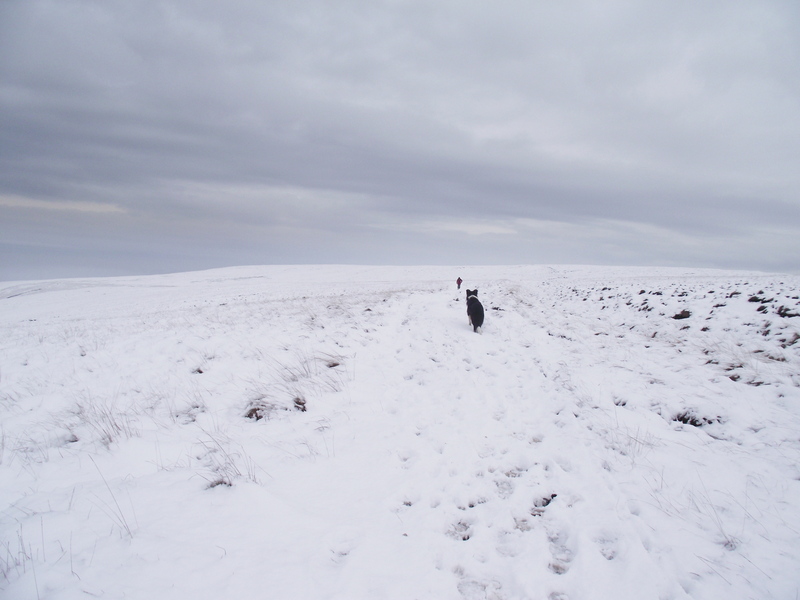 And keep Violet off them Yorkshire moors – bleak isn’t in it! violet… to late, she’s already wandering about out there…!